Carl Demonte Crawford (born August 5, 1981), nicknamed "The Perfect Storm", is an American professional baseball left fielder with the Los Angeles Dodgers of Major League Baseball (MLB). He bats and throws left-handed. Crawford was drafted by the Tampa Bay Devil Rays in the second round (52nd overall) of the 1999 Major League Baseball Draft. He made his major league debut in 2002. Crawford has more triples (121) than any other active baseball player. Crawford is a native of the Fifth Ward area of Houston. He participated in the Reviving Baseball in Inner Cities program, and attended Jefferson Davis High School in Houston, Texas, and was a letterman in football, basketball, and baseball. As a child, he was on the same little league team as Michael Bourn, who would become a star for the Houston Astros and the Atlanta Braves. In high school baseball, he began working with former #1 pick Willie Ansley after his sophomore year.He batted .638 as a senior. In the summer of his junior year in high school coach Ansley advised him to get on a team that played in the same tournaments that Josh Beckett played in so he could be seen by the pro scouts and Crawford joined the Pasadena Stars select baseball team. It was there that he gained his first real exposure to Major League Baseball scouts. So intent on capitalizing on this exposure, he was advised by coach Ansley to skip basketball his senior year to concentrate on baseball so that his knees would be fresh from the beginning of the season. Crawford was offered scholarships to play basketball as a point guard at UCLA. He also had an option to play college football as an option quarterback at Nebraska, USC, Oklahoma, Florida, and Tulsa. He had originally signed a letter of intent to play football for Nebraska but he turned down both offers in favor of a baseball career. In 2009 he had the best range factor of all starting major league left fielders (2.34). He won his second consecutive Fielding Bible Award and third overall at left field. On April 27, Crawford tore his oblique muscle in a game against the Giants and was placed on the disabled list. He did not rejoin the Dodgers active roster until July 21. He appeared in 69 games for the Dodgers in 2015, hitting .265. In December 2013, Crawford announced his engagement to Evelyn Lozada. Crawford has a son with Lozada and two children from a previous relationship. ^ "Carl Crawford Statistics and History". ^ Grant Brisbee (September 29, 2011). "Carl Crawford And The Red Sox: The Perfect Storm". ^ "Career Leaders & Records for Triples". ^ "Houston's RBI program gives kids opportunities". ^ Lauber, Scott (January 7, 2011). "Deep in the heart of Carl Crawford". ^ "Childhood friends Bourn, Crawford watch careers take different paths". ^ a b c d McCarron, Anthony (December 12, 2010). "Carl Crawford shifts dynamics of rivalry between Red Sox and Yankees in American League East". ^ "Tampa Bay Devil Rays timeline". Tampabay.rays.mlb.com. May 24, 2013. Archived from the original on March 21, 2014. Retrieved August 27, 2013. ^ Chastain, Bill (July 1, 2007). "Crawford selected to AL All-Star squad". ^ "Carl Crawford 2007 Batting Gamelogs". Baseball-Reference.com. Retrieved September 12, 2007. ^ "Face of the Franchise: Tampa Bay Devil Rays". ^ "MLB Player Fielding Stats – As lf – 2009". ESPN.com. Archived from the original on July 22, 2009. Retrieved October 14, 2011. ^ Joe Smith (September 29, 2010). "Crawford voted Rays Team MVP, Davis tabbed top rookie". ^ Marc Topkin (November 11, 2010). "Carl Crawford wins first Silver Slugger Award". ^ "'"Boston Red Sox sit Carl Crawford; hopes to get back 'focus. ESPN.com. April 16, 2011. Archived from the original on March 18, 2014. Retrieved October 14, 2011. ^ "Active Leaders & Records for Fielding % as LF (s.1954)". Baseball-Reference.com. Archived from the original on February 15, 2014. Retrieved October 14, 2011. ^ a b Dilbeck, Steve (March 18, 2014). "Carl Crawford leaves minor league game with 'minor' shoulder injury". Los Angeles Times. Archived from the original on March 19, 2014. Retrieved March 21, 2014. ^ "Carl Crawford Injury: Red Sox Outfielder Has Sprained Ligament In Elbow". ^ Austin Laymance (September 17, 2012). "Outfielder Carl Crawford back in lineup for Red Sox". Boston.redsox.mlb.com. Archived from the original on March 20, 2014. Retrieved August 27, 2013. ^ Kevin Baxter (April 1, 2013). "Carl Crawford quickly makes believers of Dodgers". ^ "Boston Red Sox vs. Tampa Bay Rays". ^ "Tampa Bay Devil Rays". ESPN.com. Archived from the original on December 3, 2013. ^ Basketball Wives' Evelyn Lozada is engaged"'". ^ "Evelyn Lozada Welcomes a Baby Boy". 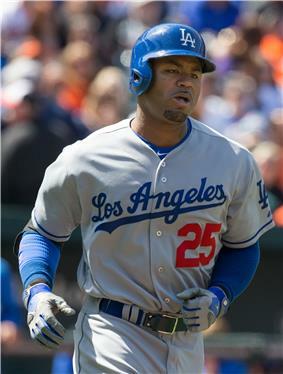 ^ "Carl Crawford Baby Mama: Dodgers Star Seeks To Stop Ex-Girlfriend Amy Freeman From Moving To Calif., Report Says". ^ "Dodgers Star Carl Crawford YOU'RE RICH, PAY ME ... Says Baby Mama".